At first, video signals coming from a CCTV camera was set to be carried by coaxial cables, which lasted for many years , even where new means of transmission appeared, such as UTP cable , fiber optic , etc. Coaxial cable was invented by English engineer and mathematician Oliver Heaviside, who patented it in 1880. It is basically made up of a copper wire surrounded by an insulating material surrounded by a metal shield, having a characteristic impedance of 75 ohms. His name - coaxial - comes from the fact that all its components are distributed in concentric layers with the same axis (the cable center). Its purpose was to be used as a transmission line for RF signals (radio frequency) because the biggest advantage of a coaxial cable on other means of transmission is that electromagnetic field generated by signals traveling through the cable is confined between the center conductor and the braided shield - creating a Faraday cage - which allows this type of cable can be installed near metallic surfaces without loss in the signal. On the other hand, grounded grid protects transported signal from external electromagnetic interference. Coaxial cable RG-59 / U is surely the best known for CCTV system installations. But where did that name come from? Currently, RG indication already is no longer part of JETDS system, meaning that cables available in the market do not necessarily meet military specifications. As the number of ID system is sequential, it's obvious that RG-6 cables and RG-11 are before RG-59. And it is exactly this: RG-59 is the youngest brother of RG-6 and RG-11 cables; it was created as a more economical option and ease of installation for those who do not need to reach greater distances provided by his older brothers. If you ask most installers which is the maximum distance to use for RG-59 (decently! ), they will say it is about 240 m .
Well, that was close to the truth when cameras had only 330 lines of resolution. But as has also been explained in Part 2 of this article series, in "But why frequency is important? ", the higher the camera's resolution, the lower the maximum distance allowed . This means that if you install a 700 lines of resolution camera with 228 meters of RG- 59U cable, images from this camera will come to DVR / monitor with only 330 lines of resolution! In other words, you've wasted the resolution - and a more expensive camera - by making a poor choice of cable. Seen it happen often in the company I worked for. From time to time some installer called me complaining that the 600 HTVL camera I had shown him is no good. He went to his client promising a better picture and changed micro camera customer had installed by the 600 TVL professional camera but image remained the same! As table above is based on theoretical data, I decided to check that information for myself testing some cables from the market. For this, I asked a distributor which were the two types of coaxial cable RG-59 (decent) that he sold most of which borrowed 1 roll of each to be tested at CCTV Institute lab. For the tests, I took into account the IRE standards, which considers a video signal acceptable up to 50% attenuation. Cable 1: RG-59 min - 4 mm outside diameter, 0.4 mm diameter solid copper core, 85% of pure copper mesh. For up to 125 meters (410 ft.), cable is able to send all the frequencies from 1 to 10 MHz while maintaining video signal within acceptable limits, i.e., perfectly feasible for use with cameras up to 800 HTVL. For up to 200 meters (656 ft.) , video signal is maintained within acceptable limits for up to 5 MHz, i.e., feasible only for cameras below 400 HTVL. 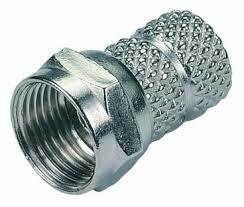 Cable 2: RG-59 - 6 mm outside diameter, 0.813 mm diameter copper-clad steel core, 67% aluminum mesh. This cable, even though thicker, has two features not recommended: Copper-clad steel core and aluminum mesh. For up to 160 meters (524 ft.), cable is able to send all the frequencies from 1 to 10 MHz while maintaining video signal within acceptable limits, i.e., perfectly feasible for use with cameras up to 800 HTVL. For up to 200 meters (656 ft.), video signal remained within acceptable limits for up to 8 MHz, i.e., feasible to be used with cameras up to 650 HTVL. - Due to its reduced thickness, up to 125 m away compensates more using RG-59 mini than RG-59, at least for the ones tested tested here. It already dawned, but finally you could leave everything working. Bad contacts ceased and all cameras are being displayed on the monitor. Now you need to be very careful, hold your breath to carefully close rack's back cover and moves away in small, light steps, avoiding any sudden movement. When you return to the front of the monitor, your heart rate increases. But with great relief you realize that all images are still there. You quickly dismiss the client warning him that everything is OK without going into details. Run to your car and try to get away as quickly as possible of that work. What a night! Unfortunately, this situation is quite common: Wiring problems come to account for 80% of the calls for service. This causes great dissatisfaction to the customer, that will be tired of having to call you all the time and certainly will never hire you again nor recommend your services to anyone and, in addition, have you ever stopped to calculate how much it costs each called maintenance? The displacement of a technician who could be doing something more useful to you, like working in a new installation? But this is an easy problem to isolate. If you have correctly calculated the cabling to carry video signal and power to cameras and didn't use poor quality cabling neither did cable splices inside the pipe (Argh! ), then there is only one culprit left: Connections. 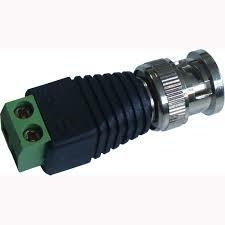 1 - The standard connector in CCTV is the BNC connector, which is the connector found on rear panels of cameras and DVRs. So, if default connection is BNC, then use BNC connectors only! Never use F connectors with an BNC to F adapter. F connectors are for RF applications and has some models , such as the photo below, which are simply twisted around the cable mesh - preferred because they are easy to install. And to give poor contact also . This type of connection should not be used under any circumstances. For bench testing, with just a few meters of cable, it's OK. But it should never be used in an installation. 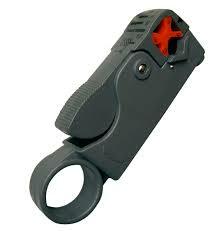 Same considerations as of previous item. This is not so bad. If welding is done well, it can be used . But it is not practical because it requires welding on site, sometimes in an open, windy, site, which hampers a solder well made. 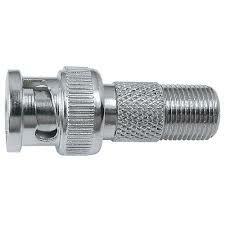 Therefore, it is very common to poor contact with cold weld in this type of connector. It should also not be used, mainly outdoor. It can be said that above connectors are for consumer applications, for rapid testing . Not suitable for professional applications, for permanent premises in the works. 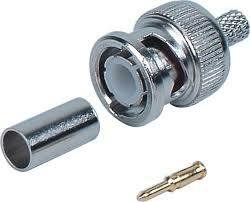 They are more expensive than previous connectors and require special pliers and some skill in their assembly, because any error disables the connector since it can not be reused . However, the investment is worth the shame because, when properly applied, rarely have poor contact . 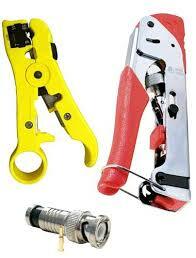 They are the most suitable for professional applications. For their cost / benefit, they are the most currently used . They presents a good result, but requires a lot of skill in their assembly. It is the champion of poor contact in the works, as if mesh is unsuccessful pressed, cable easily escapes from the connector. It is the latest, the most expensive of all, and my favorite. It presents a very strong connection and does not require much skill in the assembly. That's what I recommend . As assembly uses to work at first try, loss of connectors is smaller wich compensates its higher cost. Not only coaxial cables must have an impedance of 75 ohm, connectors also! When buying BNC connectors, always check if they are 75 ohms. A final recommendation is that one should always choose the BNC connector with the proper dimensions for each cable. 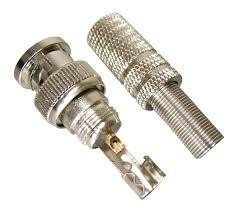 For example , you can not mount a BNC connector for RG -59 cable into a RG- 6 or RG- 11 cable; cable will not fit the connector. 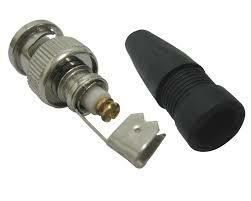 The opposite is also true: an RG -59 cable mounted in a connector for RG- 6 or RG -11 will take off, giving poor contact . So to grab the right connector to the right cable, always check the specifications of manufacturers. 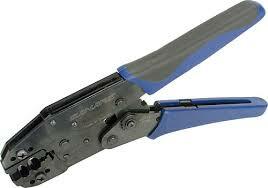 Pliers for stripping, crimping or compression should also be suitable for the type of cable / connector used. 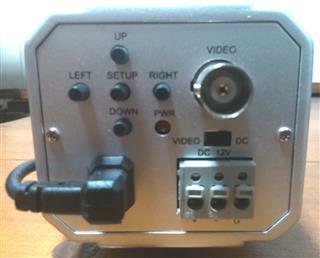 Connections between coaxial cables and BNC connectors are the simplest and more reliable because there is only one coaxial cable with two BNC connectors connecting a camera to a DVR / monitor. Thus, whenever infrastructure and distances involved permits, prefer to use coaxial cable with compression connectors. And remember that even if you are using another type of cable with converters (UTP or fiber, for example), you still have BNC connections in cameras and DVRs.